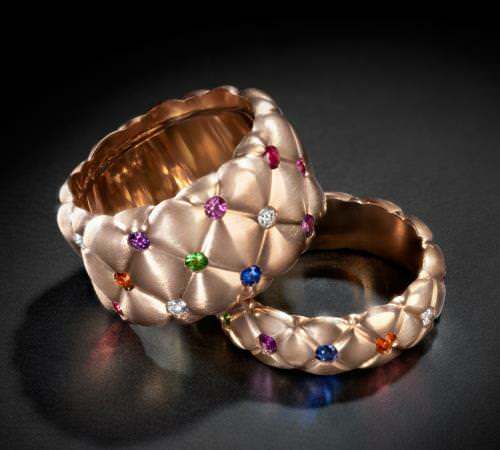 The Treillage collection is inspired by the Diamond Trellis Egg, created by Faberge in 1892. The trellis pattern also featured on Faberge cigarette cases, parasol handles and picture frames, becoming a signature Faberge motif. This sumptuous collection of rose and white gold cushion-patterned jewels is studded with luminous coloured gems including rubies, amethysts, orange, yellow, pink and blue sapphires, tsavorites, emeralds and cognac and white diamonds. The evocative designs, with their soft, tactile and gem-set quilting, represent the perfect marriage of heritage and modernity that is so much part of Faberge’s ethos today.